Big data is becoming a more important weapon in businesses’ arsenals, with a survey finding 92 per cent of big data users are happy with its business outcomes. In a report released last week from management consulting company Accenture, researchers surveyed more than 1,000 people working at companies within seven different industries, spread out over 19 countries. These companies had done at least one big data implementation, and so far, it looks as though those implementations are working out. Ninety-four per cent of respondents said they felt their big data implementation was meeting their needs. While big data was something of a buzzword just a few years ago, it now seems to be getting plenty of mainstream adoption among business users, especially those working at larger enterprises. Overall, 59 per cent of respondents said they felt big data was “extremely important” to their organization, while 34 per cent said it was “important.” Just six per cent said it was “moderately important,” but researchers did not register any numbers in the “not very important” category. So what are these businesses using big data for? Some of the ways listed in the report include taking advantage of customer relationships, refining product development, reorganizing business operations, making the organization more focused on data, as well as optimizing the supply chain. Among those surveyed, there also seems to be a strong belief big data is only going to continue to become more important. Eighty-nine per cent of those polled said they felt big data would “revolutionize” our day-to-day business operations – pretty much in the same vein as the Internet. Another 79 per cent said they agreed with a statement suggesting companies that don’t invest in big data will not stay competitive, and may even face the prospect of becoming extinct. This is also true here in Canada, where executives seem just as excited about big data as their global counterparts. Among the 50 Canadian companies polled, 98 per cent of respondents said they’re using big data to find new sources of venue, while 90 per cent are doing analytics on their data to keep their customers and reach new ones. Another 86 per cent are using big data to build new products and services. 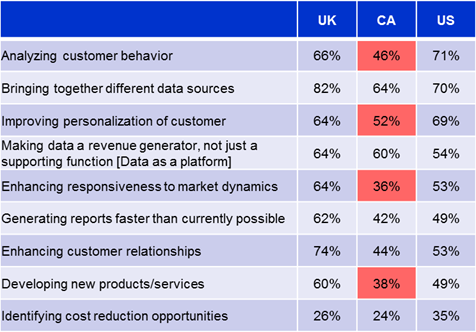 Outside of Canada, there are still a lot of challenges for big data users all over the world. About 57 per cent of global respondents said they’re relying on consultants to manage their big data solutions, while another 45 per cent are working with contract employees. Another 34 per cent reported working with tech vendors, while just five per cent said they were able to rely solely upon their internal resources. To become more comfortable with big data, companies are investing time as well as money into their projects. Fifty-four per cent said they were running technical training internally for their employees, while another 50 per cent said they were sending employees to vendor-based workshops. Another 49 per cent said they were doing independent research, while 33 per cent were investing in external technical training.